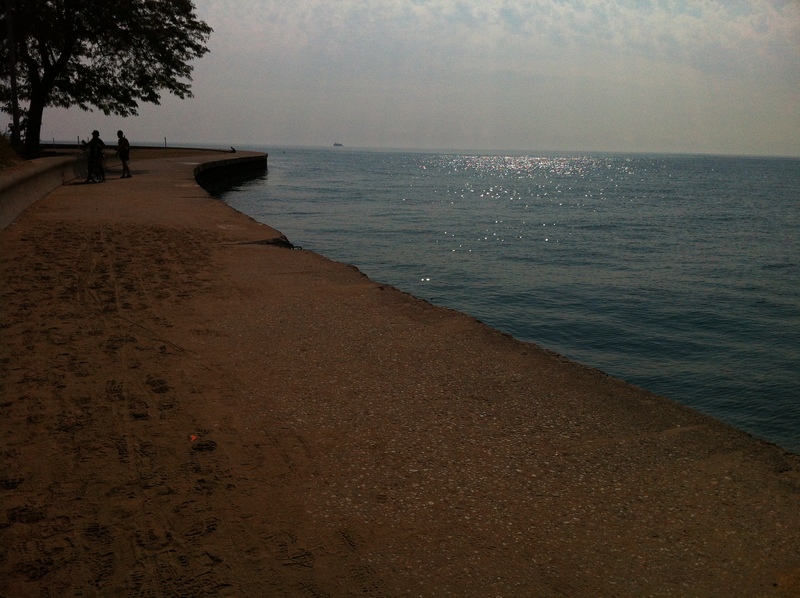 My running has been scattered, I’ve been going from 50 to 30 miles before Chicago. B 55 miles after Chicago and back to 40 miles last week! B Right after Chicago I dove straight into running, 11 days none stop for 95 miles. 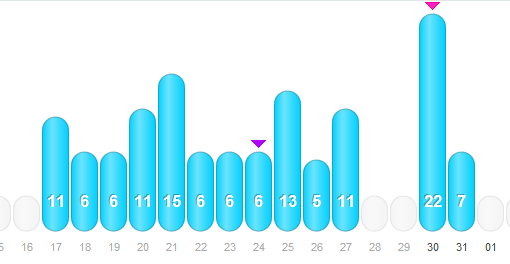 B I won’t go into the detail of most runs since all my emotions have been poured into my Daily Mile updates instead but here’s a summary of the runs by day. – I think the 13 and some of the 11 milers were done in two parts between lunch and post work. With time management I am finding itB physicallyB and mentally easier to run twice in one day then once in a long time. – IB struggledB through the 15 miler by listening to gardeningB pod-casts. B I don’t actually think IB absorbedB anything or had any clue what they were talking about but it made me feel like I was multitasking and not just doingB somethingB I wasn’t in the mood for (like running). – I’m been doing fartleks (not to be confusing with farting haha) on my treadmill runs. B I don’t think it’s the best kind of training for me since I should work on keeping a pace but those help make things less boring. – I skipped a long run this weekend because I was visiting my family in NY. B Between 9 hours on a bus and just how fast a day and half fly by, I decided taking a 3 hour run was not the best use of my time. B And no waking up early is not an option. B I love my sleep dearly. – I was stubborn. B So stubborn that I decided I couldn’t go to bed until I did a long run on Monday. B The 22 miles is composed of 6 miles during lunch and 16 after work. B The 16 miles were hard physically. B I thought two days of rest would make me amped up for speed, instead I wanted to sit on the couch and watchB Olympics as I ranB vicariouslyB through the professionals on TV. B I took an 8 minute break around mile 14 where I had to beg myself into going back outside for 2 more miles. B In the end the average pace with break was 9:41. B I know that I ran around 8:30 for the first 8 miles before I just lost energy. – I did take Gu Chumps, but Gu Chumps can’t replace a real meal that my body wasB cravingB at 7:30 PM. B I tried to tell it that if it waited til 9 a burger and beer was waiting for it, but it wouldn’t believe me. B I listened to about 3 running podcasts to keep me motivated. – Run Run Live podcast is awesome so I highly recommend it for some mojo on your run. Why am I soB insistentB on long runs again after calling it quits for the summer? Well I must confess, flipflopped back on running the RnR Montreal marathon if I don’t have to work that weekend. B I had a slightB freak-outB when all the promo hotels with group discounts were sold out. B But! I found shelter for $36 a night next to the starting line. B AirBnB rocks! I will also be using AirBnB for renting a room for the Providence RnR half marathon! B While I haven’t personally stayed in a room through the site yet, friends that have said it turned out cheaper and better than a hotel room so we shall see. Since Tony wasn’t there with me, I got this all to myself! Alas, no curtains were purchased at Ikea but somehow I walked out with a full belly instead. B I must say, next time I’m going to try to trade some of the balls for more mashed potatoes. B It was great! Can I just say that the free secret cupcakes they have everyday is the best worst idea ever. Hope everyone had a great July! Can’t believe it’s August in a night’s sleep. B Where did my summer go! After a day of walking around downtown Chicago we slept in with no alarm. I still stayed on Boston time and took a run instead. Finally after much wasting time around the hotel room, we made it outside. We made a stop at Wrigley Field. It was actually a small mistake as I decided to randomly exit there. A game was happening so it was a bit insane. Madness… so we got back on the train and went further north until the train went no more. Then we took a commuter rail further north. Finally we arrived somewhere that was within a mile walk of the Chicago Botanical Gardens. Much to our surprise it was free! I guess that’s why the sales tax is like one million percent. 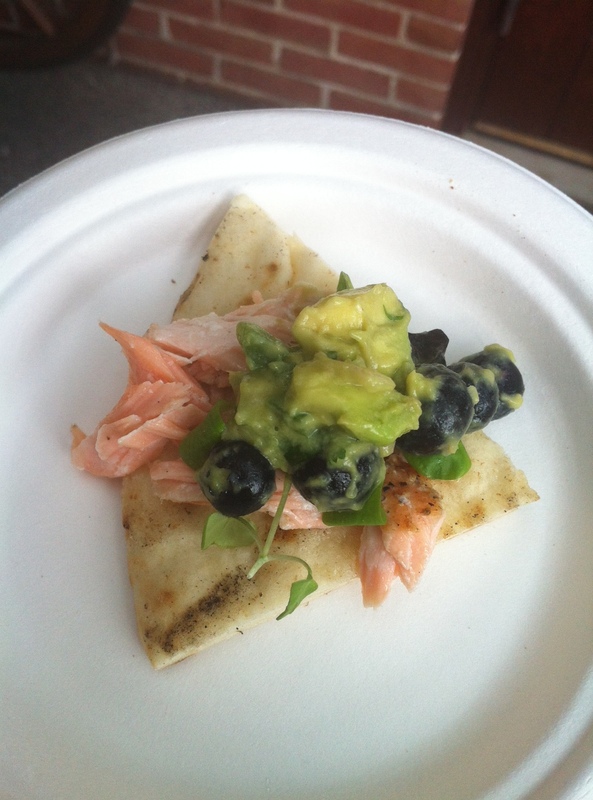 Who knew that avocados andB blueberriesB worked so well! So it rained and rained after eating and waiting for over an hour we sucked it up and purchased this fashionable wear. There was a mile of walking to the train so I was worried for my electronics.Well… needless to say as soon as we got fashionable, it stopped raining.You welcome Chicago Botanical Garden visitors.LuckilyB admissionB to the park was free so I considered these overpriced ponchos as part of my donation to the gardens. Proof that it really did rain! They also had a really awesome Japanese garden but I didn’t take any pictures there because I was enjoying being peaceful and zen. It’s not a true vacation until Subway is consumed.Sometimes you just want something cheap, and filling and Subway hits the spot.Smelling flowers make you hungry.Don’t worry we kept it classy with some wine. As we walked from our hotel toB MillenniumB park I can tell you that theB MagnificentB Mile gets a whole lot less magnificent.I guess all the crackheads and bums only come out at night in Chicago while on the east coast they work full time full day of creeping little girls out. The hatch thing had an evening concert as well and they were performing Broadway songs!We even got a seat mid-show. No need to sit on a grass or watch in envy for all those well prepared lawn chair peeps. Great performance! And I only got 1 mosquito bite. A winning night. I even found the bean I couldn’t find the day before in daylight. Of course the night didn’t end there, as we walked back to our hotel we saw fireworks! I think they are shot from Navy Pier. 3. Subway – Spicy Italian is the only way to go! Tony and I took a 6AM flight from Logan to Midway which let us explore the most in day one without having to pay for a hotel the night before. 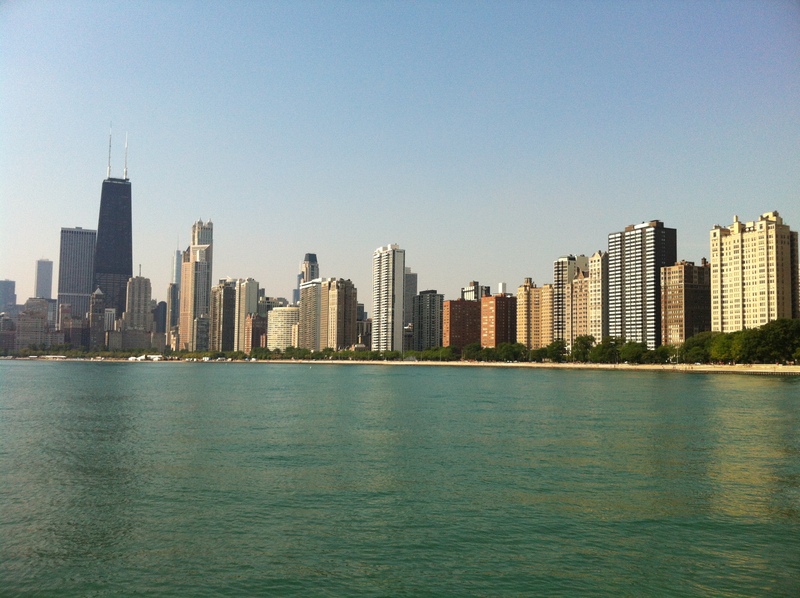 It was early and after checking into the hotel we started by walking down to Millennium Park… Well actually correction, I started by walking us in the wrong direction (north vs. south).It was a good mile uptown before I said to myself, hmm the lake seems to be on the wrong side! Projects like this always go beyond budget and have a ton of corruption behind them but the results are still so amazing and great for a city. Down with parking lots up with parks! Roar! We walked past the smells of Taste of Chicago (I decided to pass on sausages and hot dogs in exchange for finer snobby dining) and made our way to Buckingham Fountains.We had lunch reservations at 1:30 and it was mind over stomach! Also a sad but gross display, Toms are comfortable BUT nothing including Toms will be comfortable in 95 degree weather as you walk around for miles being a tourist.My feet cried for flip-flops and I’m pretty sure these shoes lost 10 months of wear from me pressing in the back. Yup.. that was it. My cat could vomit up a bigger plate of food! Give me a slice of bread with it at least.Those are small thin pieces of wood-grilled sturgeon with some kind of sour white sauce on the side.It tasted great but I was hungrier afterwards then I was before it. Then there was the terrible service.It’s not that our waiter was rude, he was quite polite and seemed like a nice fellow, but each course took over 35 minutes to get there. I get it that when you sit down things take a while to get started but you usually don’t have to wait 35-45 minutes between each plate. Before the dessert came out, I was wondering if the chef drove out to the woods to pick the blueberries himself.We got there at 1:30 PM and it was 3:30PM on a Friday.The place was mostly empty so it wasn’t that they were swamped with orders.Finally after staring for 45 minutes at my mostly empty plate, this came out.No apologies, no explanations, as if I really have nothing better to do than sit and stare at an empty plate for 45 minutes.Don’t get me wrong, the blueberries with hay ice cream, smoked honey meringue, thyme were delicious, but I was starting to get a splitting hunger headache. Tony got a burger that he claimed was tiny but it looked like a meal fit for a king compared to mine. Luckily he had some fries that I stole as my plate became empty fairly soon. Two hours later and more hungrier than before we walked back to the hotel for a nap. After nap time we went to a random sketch comedy thing I found on GoldStar comp tickets.I highly recommend if you’re bored with nothing to do and want to go out check out the comp section. We walked around Wicker Park, a sort of Williamsburg wannabe.I loved all the shops, and restaurants and could have started a new home there and been happy. Luckily for our second meal of dinner.It did not disappoint !Cumin, a modern Nepalese restaurant was just what we needed to regain our confidence in Chicago dining. I went with cauliflower florets deliciously cooked in nepalese spices with tomatoes and ginger-garlic paste and Tony went we a chicken curry dish and we had ourselves a happy feast! – If you’re in Wicker Park, check out Cumin!You must, you must! It was so good.Looking at the pictures is making me drool! I’ll continue my Chicago recap with my second favorite part of the trip; dining at Girl and the Goat! B After running in Chicago, this was my favorite. B It was a struggle finding space for a reservation as it seems to be booked months in advance. Luckily I had a perfect day for a 4:30 dinner; Monday the day we flew back to Boston. B 97 degrees where all we could do was seek refuge in air conditioned stores and watering holes. B 4:30 couldn’t come soon enough. Tony got himself a cognac, bourbon cocktail while I stuck to beer. B I tried the Salt Lake City Dubhe Imperial Black IPA B which I never had before. It had the taste of mild stout with theB crispnessB and hop of an IPA. B Very fun. We picked out 6 tapa style plates. B Our first was this tomato bread that they make fresh in theB restaurant with a side of spicy picklesB . Next was theB bristol bay sockeye tartare withB truffle vinaigrette, summer squash & popiah. I wasn’t sure what popiah is but I assume by the process of deduction it’s the crisp bread on top. Next came the goat empanadas and I think this was my second favorite out of the 6 plates we got. B I don’t remember exactly what was on it since I didn’t take a picture of the goat part of the menu, but it was delicious. This was our first time trying octopus. B It was more tender and juicier than calamari and I love it. B I don’t think Tony was into it as much but I traded him some extra from the other plates for more of this dish. B It was my favorite out of the 6. Next were the scallops with foie gras vinaigrette, klug plums,B sweet onion & brioche crouton.B Scallops are awesome; ’nuff said. Our final of the 6 plates was the Pig Face… Not quite sure what to expect before it came out. Our waitress was perfect. B We told her that we had to leave by 6:15 to head to the airport and she made sure we were paid and all set to leave exactly by then. B However, we just couldn’t help ourselves and ordered a 7th dish. B ZucchiniB bread and maybe a second beer haha. Overall Stephanie Izard’s Girl & the Goat was one of the finest and unique dining experiences I have had. B I don’t think I have eaten anywhere where I can try such a diverse and yet well prepared set of dishes. B If you live in a cave and are like me who never heard of Stephanie Izard; she’s the only female winner of Top Chef and this is her resturant. So if you find yourself in Chicago and are going out for one nice meal, try to get in here! B They always have a set of walk-in tables but I’m not too sure how long the wait is. B Luckily, there’s a comfy set of couches and a great bar to wait by. As my holiday came to an end I wasted no time in getting back to (running) business. Tuesday 10.5 miles broken up with 6 for lunch and 4.5 after my slow stretch and strength class. Today was the same 6 during lunch that felt difficult and draining with the humidity on full blast in the gym. B I went in the late afternoon after everyone worked out so the sweat of all others was fully in the air! I’m excited for the half marathon in Providence at the end of August and wish it was sooner as I get a little depressed without racing. B I would race Tony but he just gives me a dirty look and says no. Since I have nothing introspective to write, I’ll entertain you with pictures of what I ate (last) Wednesday since this Wednesday its less picturesque. Arugula, shrimp and weird coleslaw from the cafe! Mango and spinach coconut milk protein shake; try not to like it, I dare you! And yes I have to confess, Georgetown cupcakes is as amazing as everyone says it is. I’m not a cupcake type of gal (cookies are my true love) but this pumpkin baby held my heart for the hour. B It just opened up on Newbury so feel free to check it out! I’ve been idle on R2M and DailyMile because I was marching (actually with the heat it was more like crawling in a zombie stumble) the streets of Chicago. B A recap withB gratuitousB photos is in the works. On Thursday night while I was packing I decided it was a good idea to pack 4 sets of running clothes because of 4 days in Chicago means I’ll go running 4 times… right? Total times I went for a run was once! B Lesson is that I should pack half as many work-out clothes as I think I will be using and chances are I still won’t use them for anything else besides sleeping in. 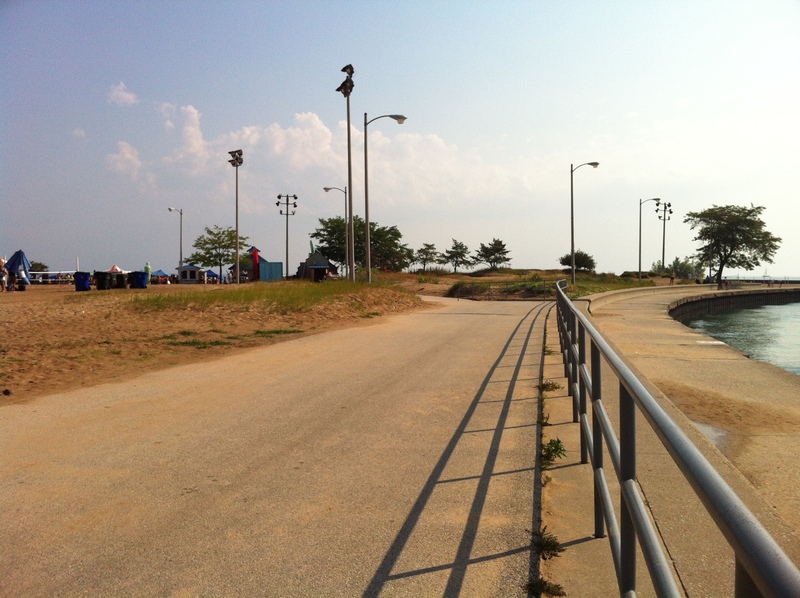 The North Avenue beach path was only half a mile north of our hotel! 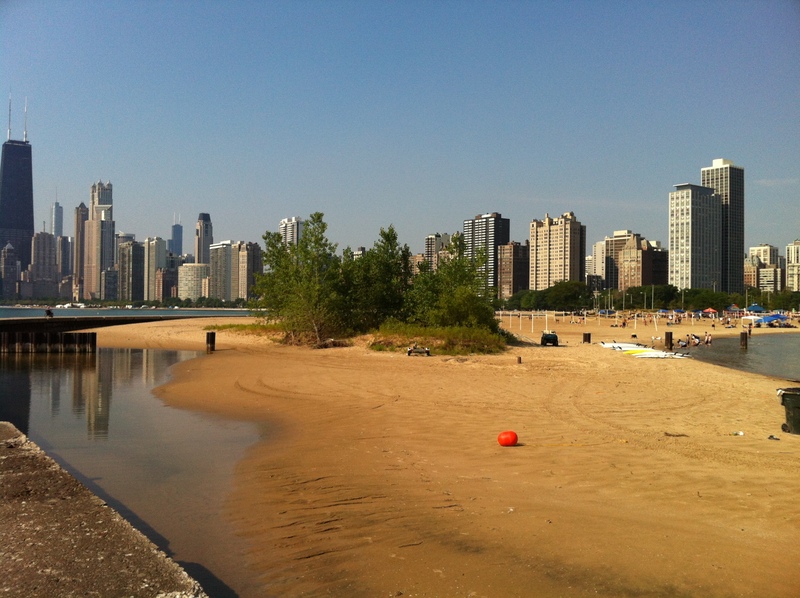 This path almost made me want to quit my job, sell my house and move to Chicago! 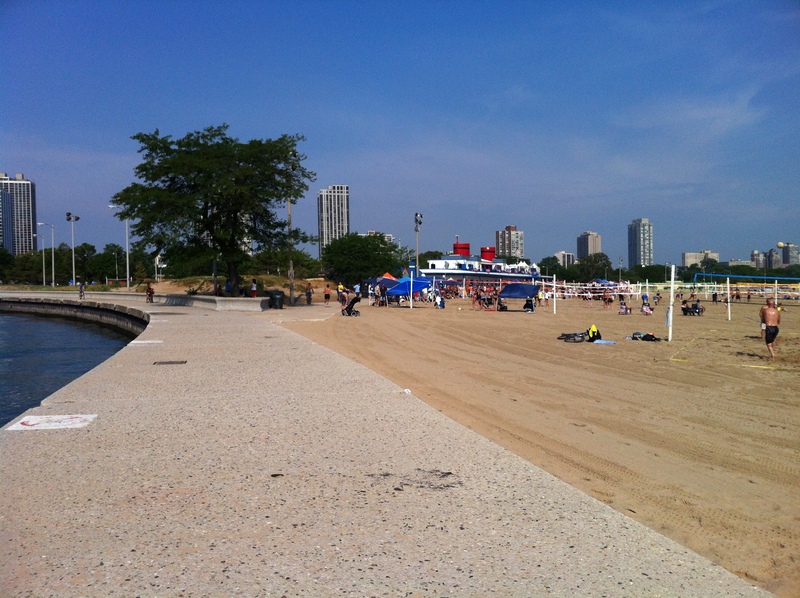 I was envious of this amazing urban beach right in the backyard ofB Chicagoans; that is until I saw how expensive it is to rent there and realized that if I did live in Chicago I would be too cheap to live by North beach. Had Tony not been waiting for me at the hotel room I think I could have ran forever. B By the time I was done the weather was hitting 85 degrees. B And yes this was the coolest day out of the 4 we were in Chicago for. B Good thing I brought my own water bottle with me. Overall about 5.5 miles on a lovely beach path. B I’m not sure the total distance as my runkeeper app and Iphone in general was going crazy bouncing signals all over the place. I almost missed out on this scenic run! B I went to the hotel gym and wanted to hit the TM before Tony woke up only to be welcomed by a broken machine and two occupied ones. B Luckily, I was stubborn and just took it outside. Next time you’re traveling and the hotel gym is a complete disappointment like it usually is, take it outside! B You might beB surprisedB by what you find. B I just followed some other running person that led me to this. B Dude probably thought I was a creepster.